RUDOLPH arrives from JAPAN! 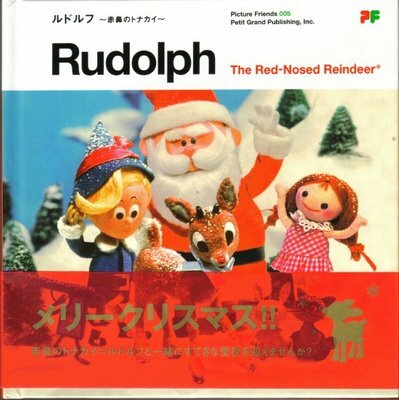 RUDOLPH is small in JAPAN! RUDOLPH arrives straight from JAPAN in my mailbox today. KAORI TANABA sent me his 6" x 6" hardcover book he published with PETIT GRAND PUBLISHING, INC. and I REALLY like it! It is a cute little book that touches on various things about the classic RANKIN/BASS Special. 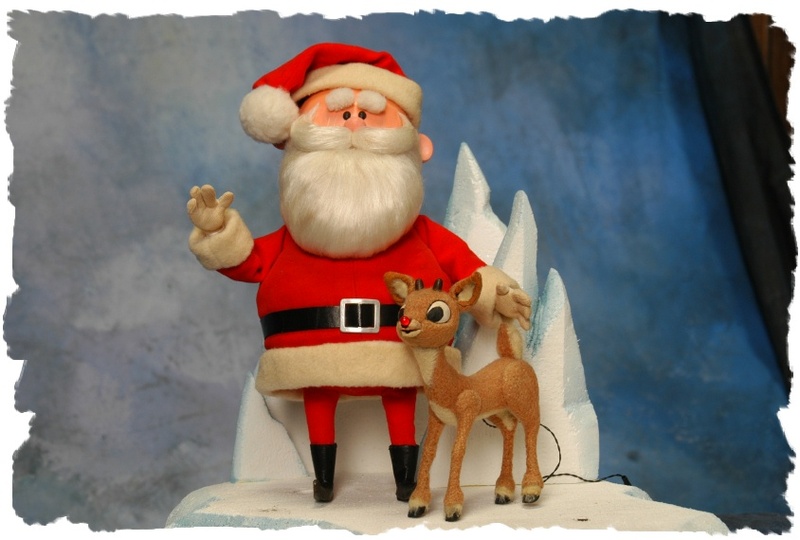 It even has a little color cardboard cutout of RUDOLPH. 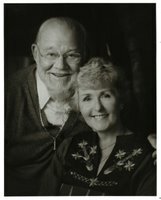 I provided alot of the pictures and information BUT it also pictures merchandise, includes sheet music and even cookie recepies! It's a cute, little book...the kind you would see in a HALLMARK store. 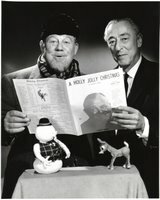 We will try to carry it at www.rankinbass.com for all the RANKIN/BASS fans in the US! I will keep you posted. 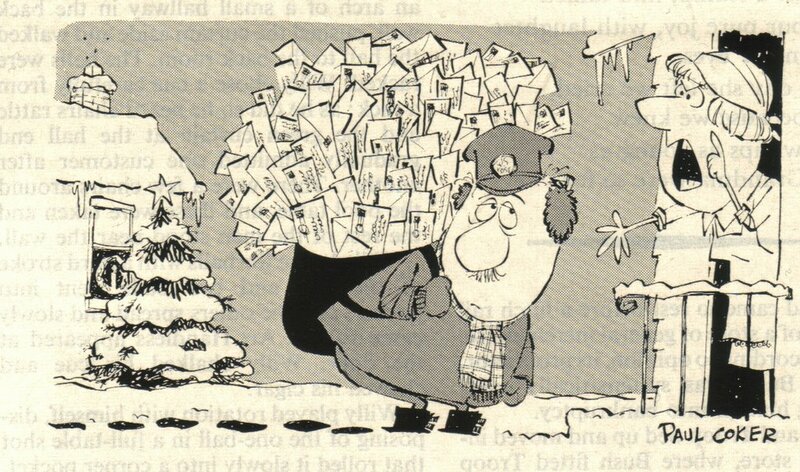 BUT I will respond to e-mails and requests when I get back to my Desk on Sunday night! DEMO: How Can You Sleep At Night? My recent demo of the song "How Can You Sleep At Night?" has been getting quite a few listens at www.myspace.com/rickgoldschmidt lately. DENNIS RIORDAN from my band THE STARVING ARTISTS plays Bass guitar on it. I hope to record it next year at Robin Wilson's URANUS STUDIOS in Tempe, AZ. The song is about a girl I thought I knew very well and it turns out that I didn't know her at all. 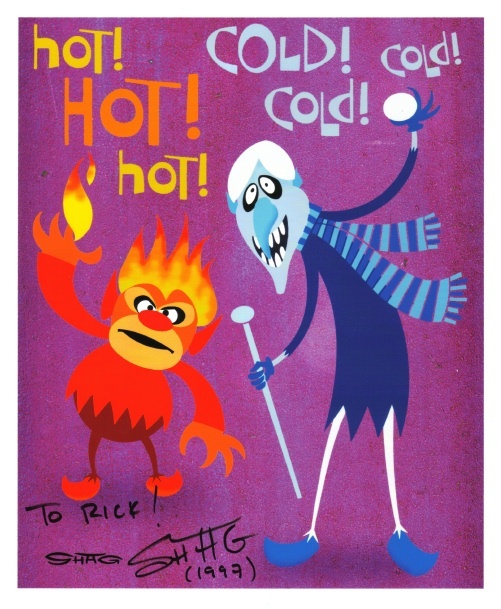 I will have copies of my CD RICK GOLDSCHMIDT SINGS at AMAZING FANTASY BOOKS & COMICS 12-24 at 5pm. It has been reviewed favorably in the NOVEMBER ILLINOIS ENTERTAINER. 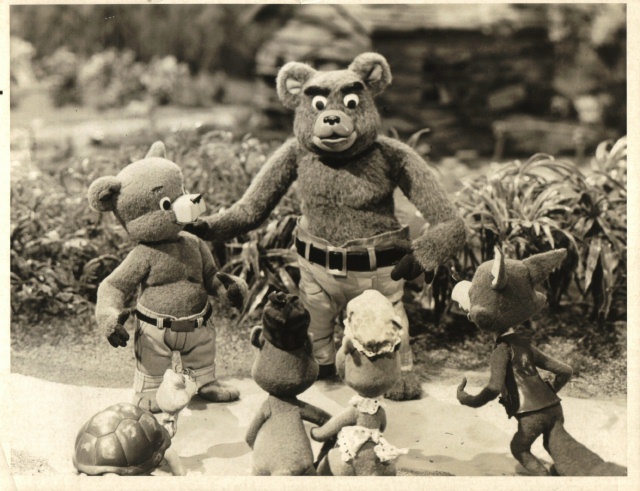 CHICAGO KID'S TV! GARFIELD GOOSE & FRIENDS! CARTOON TOWN with BILL JACKSON! 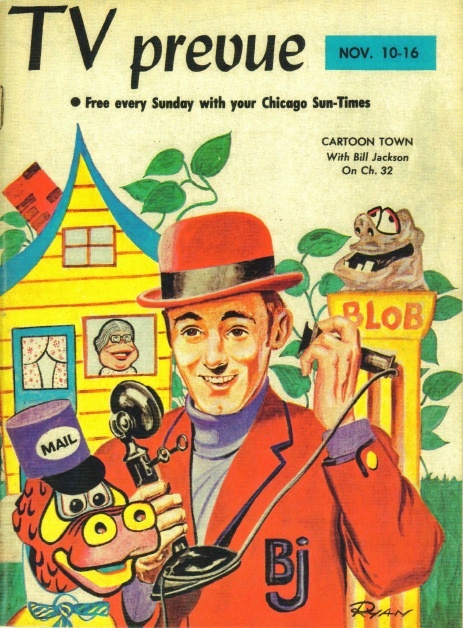 With friends like RON MURPHY, who needs RESEARCHERS for my book about CHICAGO KID'S TV? Ron constantly tracks down GREAT material like this and often lists it on EBAY under seller MURPHY8780. 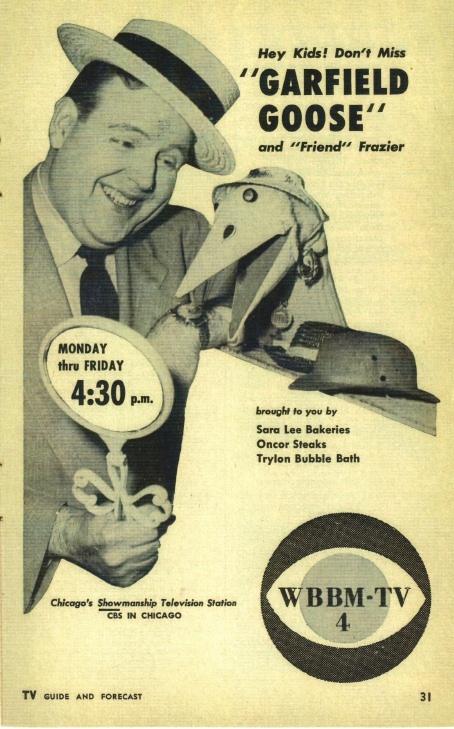 This ad features GARFIELD GOOSE & FRIEND (Frazier Thomas) before it became FRIENDS on WGN-TV. 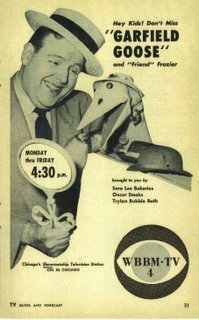 My friend BILL JACKSON is featured on a TV PREVUE in Illustrated form...visit www.dirtydragon.com This brings me back to my childhood and we recently discovered some video footage of RAY RAYNER, GARFIELD GOOSE, CAREFREE CORNERS and CREATURE FEATURES we didn't have! THE DAILY SOUTHTOWN NEWSPAPER RANKIN/BASS article! I did an interview and photo session for THE DAILY SOUTHTOWN NEWSPAPER with GEORGE HAAS and it will be out sometime next week! It may even be on THANKSGIVING DAY to promote our appearance at AMAZING FANTASY BOOKS 11-24! 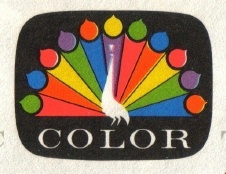 The color photos will include some of my collection and the article will cover quite a bit. Look for it in the CHICAGOLAND area! 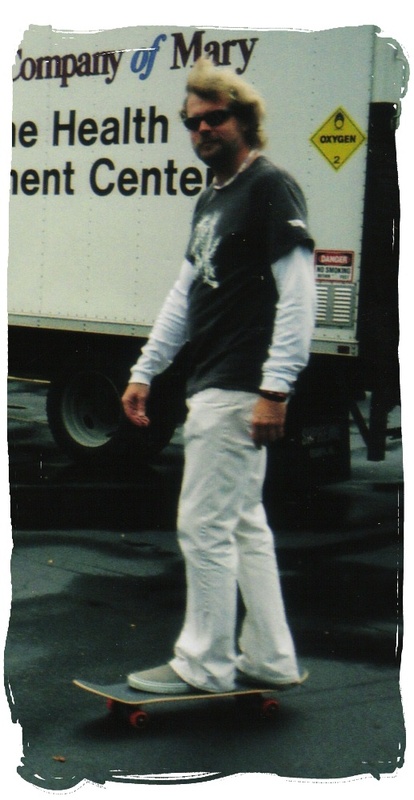 The pictures you see here are from WIZARD WORLD August, 2006. That is KEVIN KREISS of www.timeandspacetoys.com in the small group shot! Wanted to bring everyone up to date with a schedule: 11-24 6:45am CBS MORNING NEWS ch. 2 Chicago 11-24 7:40am WGN MORNING NEWS ch. 9 Chicago (Segment may also appear on METROMIX on CLTV NEWS) 11-24 5:00pm - 7:00pm AMAZING FANTASY BOOKS & COMICS in Tinley Park, IL FREE Exclusive MISER BROS ORNAMENT SET from www.timeandspacetoys.com with the purchase of a signed THE MAKING OF THE RANKIN/BASS HOLIDAY CLASSIC: RUDOLPH THE RED-NOSED REINDEER (Miser Bros Press) 12-02 & 12-03 RUDOLPH & SANTA will be at THE PITTSBURGH TOYSHOW (AKA STEEL CITY CON) at the EXPO MART in Monroeville at the TIMEANDSPACETOYS.COM booth 12-08 through 01-07-2007 SANTA & RUDOLPH will be at the CENTER FOR PUPPETRY ARTS in Atlanta, GA www.puppet.org at their museum with our friend ALAN LOUIS (Director of Museum & Education Programs) I did an interview for WIRELESS NEWSFLASH with DAVID MOYE. DAVID said it is like an AP NEWSWIRE for the world of POP CULTURE and shows like the LETTERMAN SHOW, LENO SHOW, etc. subscribe. Also, doing an interview with GEORGE HAAS of THE DAILY SOUTHTOWN Newspaper in Chicago, so look for a color article in there soon! HEAT MISER Cover song out! My friend TRENT tells me that BATH & BODY WORKS has a new 2-disc Holiday CD set out for $10 that benefits the MAKE-A-WISH charity and it features a cover of the MAURY LAWS & JULES BASS HEATMISER theme by BIG BAD VOODOO DADDY! Let's hope it is better than what I heard from the new NBC live-action special! If you are looking for the original versions of the songs, they are on my CD #1 on EBAY under seller ANIMAGIC1. With THANKSGIVING coming up...many RANKIN/BASS Fans think about the RANKIN/BASS TV Classic MOUSE ON THE MAYFLOWER (I actually have that special with the McDonald's commercials off the master tapes) BUT I like to remember the 1966 TV Classic THE BALLAD OF SMOKEY THE BEAR shot in wonderful ANIMAGIC with music by JOHNNY MARKS! I love the ANIMAGIC look and I have a perfect NBC GENERAL ELECTRIC FANTASY HOUR print of the special! JAMES CAGNEY did the storytelling and it is a long lost BUT beautifully done special. 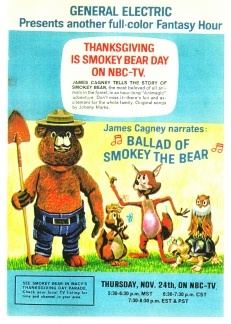 SMOKEY was even featured in the MACY'S THANKSGIVING DAY Parade that year and the special aired on THANKSGIVING DAY (I was one years old, so I don't remember that).